"White Walls" on the A-Side is just a huge psyche sound, they immediately build this fuzzy wall, like the Crystal Stilts...right into a massive release of energy. Just humming with the buzz of layered guitars, a sort of tinny high tone, the treble hanging in the air...or it's just plain hot here in the city. Gritty guitar banging out melodies over top of this thick freakness going on under the surface. The slurry piles on and the vocal is banging on down that road with a little bit of echo. Tim Cohen has this on his playlist and approves of the see saw bounce. I dream / WHITE WALLS! It's got a mysterious quality, the way this instrumentation is murky and dense, lyrically they leave you searching for meaning. I'm almost getting a more rock heavy pop Art Museums sort of sound from these guys, minus the eclectic machinery. Stops on a dime. B-Side, "Non Dot" is another heavy groove bassline caught in the back, the main melody is taking over, hardly any vocals with the heavy 1, 2 beat stomping out the kick snare. This kind of bouncy psych has to be from San Francisco (nope, Portland - ed). Surfy and really thick, repeating the tension building single note melody while another guitar is laying out a fuzzy crunch. Or that's the bass? Recorded with the perfect amount of texture to this thing, just out of focus but that just makes the center even sharper. Like that hipstamatic filter. Thanks to Water Wing Records, I have one of these to give away. Email me at jdean99 at gmail and I'll pick a winner and send it to you. Completely free. With some 7inches stickers even. Ends July 31st. 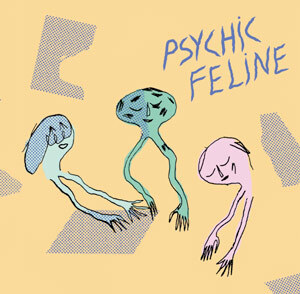 Psychic Feline consists of Bob Desaulniers, Sydney Roth and Curtis Muenze. Arising from the ashes of The Caldonias, Psychic Feline is quickly rising to the top of Portland Oregon's prolific music scene. Words like psychedelic don't even scratch the surface in this bass-less trio. With Sydney's primal percussive stomp as the platform for the guitars of Bob and Curtis, the trio create knock-out hooks, savage fuzz and soul-vibrating feedback Vocals are a tasteful additive in this 50% instrumental outfit. So it's appropriate that their newest offering and first for Water Wing contains a blistering fuzzed out rocker on the A side,"White Walls" and an instrumental on the flip,"Non Dot". Recorded by Alex Yusimov, mastered by Tim Stollenwerk and artwork by Nucular Animals' Wiley Hickson. Digital Download Included. Hey Jason, I like this!